- THIS IS NOT A MARIJUANA (weed) FRIENDLY LISTING! You WILL be subject to a $200 FINE! - The place is nicely decorated. - There is a KING bed and a futon so it fits 4 people. They are both very comfortable. - There is a nice computer desk and office chair for your business or study needs. - The WiFi is fast! 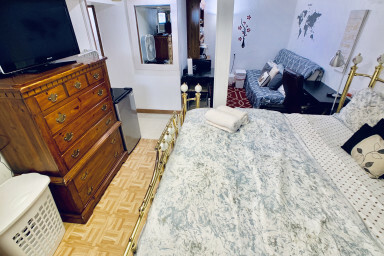 - The room is equipped with a mini refrigerator, central air conditioner and heat, wardrobe with hangers, LCD TV with cable TV with Roku stick so you can stream all your favorite shows and access apps like Netflix, YouTube, Hulu, and many more. - It also has a small kitchen with most appliances you need but it is not a full kitchen. You will have access to the full kitchen on the 1st floor apartment. The room can fit up to 4 people or maybe more if we add a floor mattress (available upon request). Everyone that comes absolutely love the room! Especially how comfortable the bed is. I'm sure you will have a great time! You will have your own studio apartment! Make yourself at home! I also have a washer and dryer available which is free to use! Parking is off street but it is free to park and easy to find a spot. It is also very safe. I have a brand new car and have no issues parking on the street. Please don't park on the driveway! I'm available for any information, assistance or guidance you may need. Don't hesitate to contact for anything. I can help with info for public transportation and also give some good tips to go to NYC or shop at Jersey Gardens Mall. NO SMOKING of any kind please! And no vapor. Or you WILL be charged an EXTRA FEE!